Have you ever lost focus, zoned out in the middle of a conversation or kept yourself up at night thinking about the perfect ______? (Insert your word here.) Yeah, that’s me. Right now my word is, “cookie”. I have no desire to gorge myself on mass quantities of flour, sugar and butter, but I love getting my hands dirty and defying science. 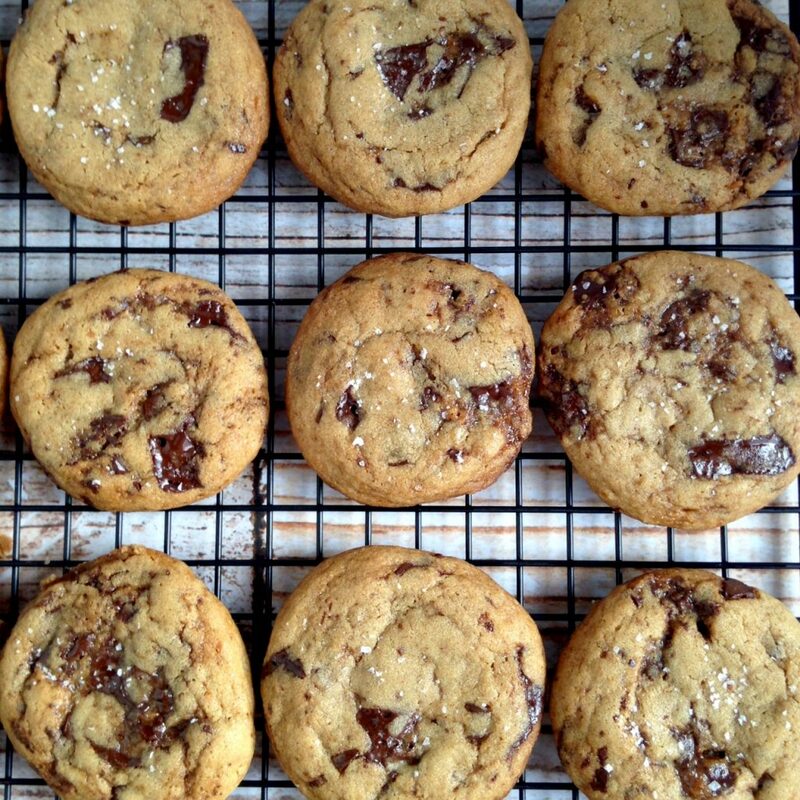 And these brown butter and vanilla chocolate chip cookies are IT. 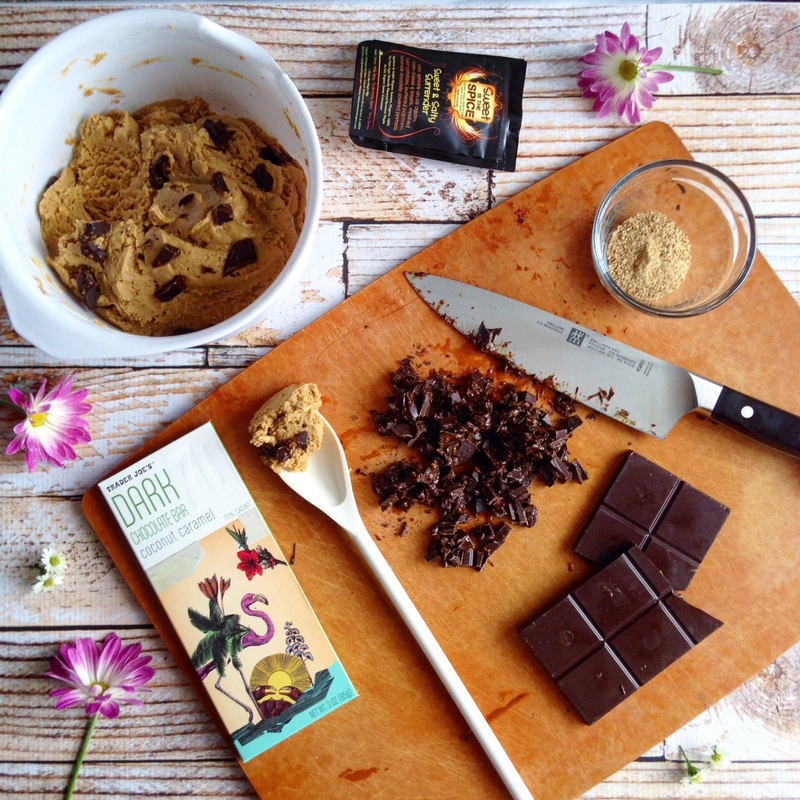 Most cookie recipes I have tried call for 2 sticks of butter… which in turn had me throwing out all of my bathing suits. However, the fact is, cookies require fat. The fat (from butter,) does create texture, moistness, tenderness, flavor, richness and “quality” of a cookie, no doubt. Except, while experimenting, I also discovered that you can omit 1 whole stick of butter and substitute in a 1/2 cup of coconut oil, (good unsaturated fat from nature). The bathing suits stay after all. Now, let’s get back to the butter for a quick sec and talk about browning it. Brown butter is exactly that…brown butter. 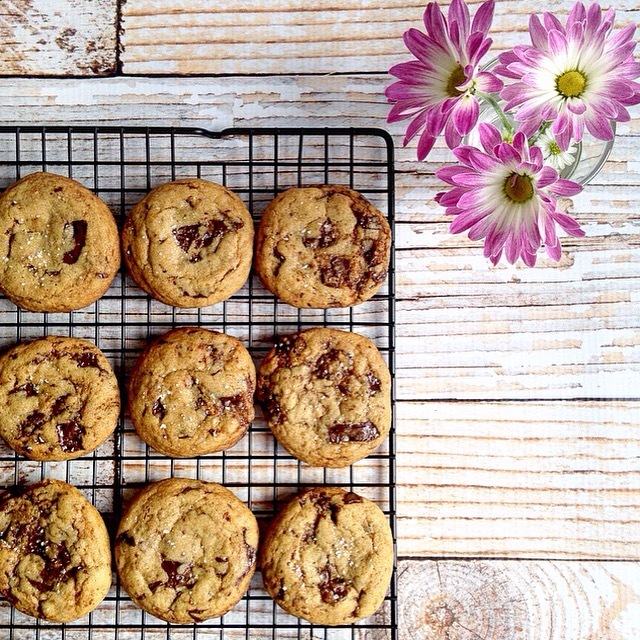 Heated in a saucepan until toasty brown (not burnt,) creates an aroma like none other. You’ll get pure whiffs of nuttiness and caramel the moment the butter is ready to be removed from the heat. Ummm, can I get this in perfume form? 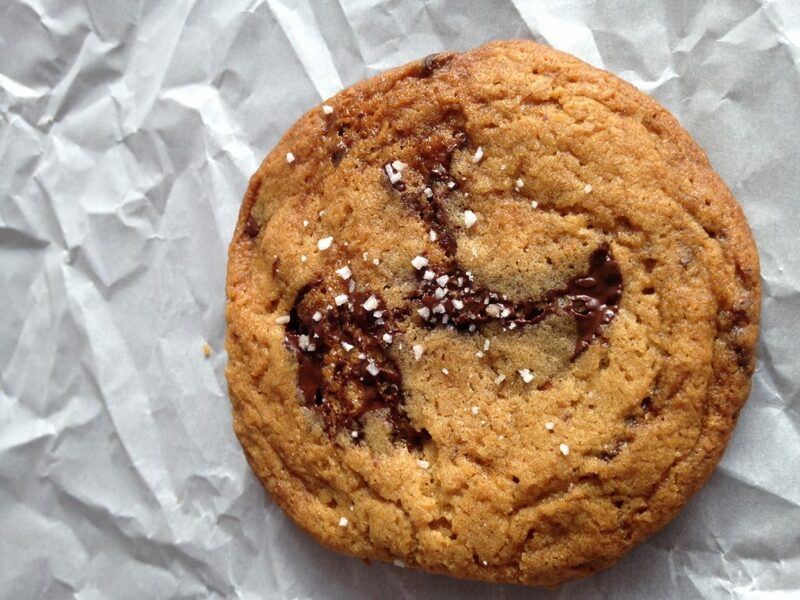 Plus, the browned butter adds a dimension of flavor to the cookie that makes it extra special. Since I’ve always been under the impression that butter should be at room temperature and never melted when making cookies, it surprised me that the volume and texture from this cookie was anything but crisp and flat. (That is the “defying science” part.) Now, because the butter is in a liquid state, the compensation of a tad bit more flour is necessary and a little R&R in the fridge is highly suggested… like a good hour. This resting period helps the cookies from spreading flat on the cookie sheet. 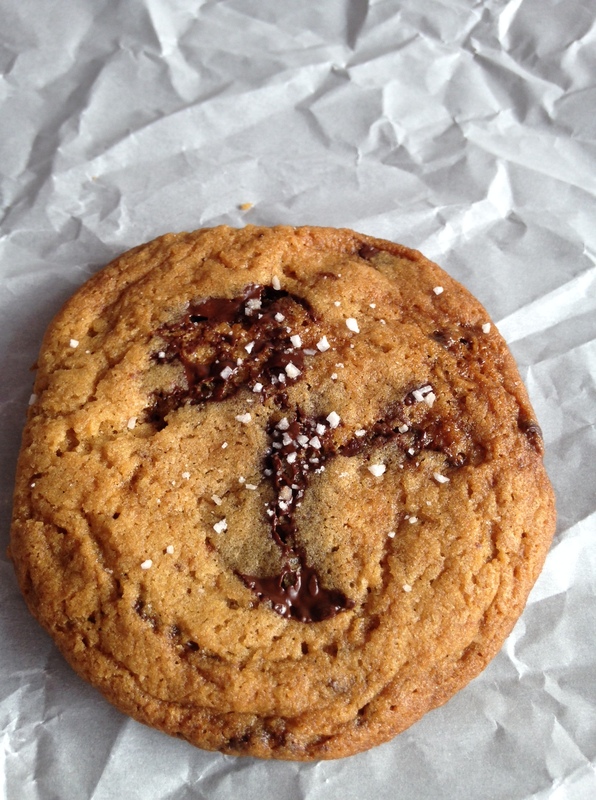 I mean, nobody really likes a “flat” cookie…they’re no fun! 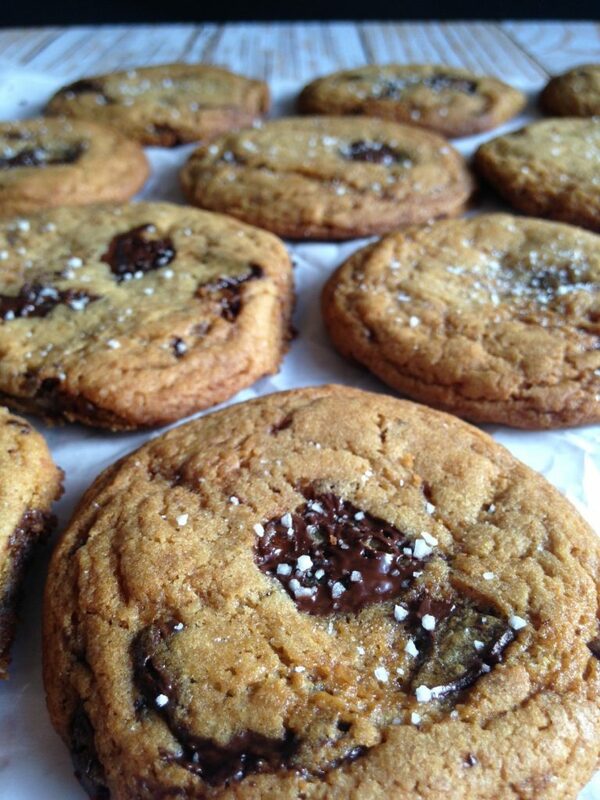 And lastly, I will forever and ever use our Sweet & Salty Surrender blend in every cookie recipe from this day forward. Both the organic cane sugar and sea salt are naturally infused with maple. So the addition of the added natural flavors combine very well…especially with chocolate chip cookies, oatmeal raisin cookies, snickerdoodles, chocolate crinkle cookies, and the beat goes on. Okay, now go dust off those baking pans, and get ready to fall in love, hard. Be sure to follow me on Instagram and/or Facebook and tag me using @sweetisthespice #sweetisthespice if you make these cookies. Who knows…you may just get featured on my page! Begin by browning the butter in a saucepan on medium heat for about 5 minutes, stirring often. Notice a very active and large bubbling stage at the beginning and then suddenly the bubbles slow to a mass of smaller more foamy like bubbles. As soon as this happens, small brown bits will begin to form at the bottom of the pan and the butter will turn to a caramel brown color quickly. There will also be a prominent smell of a toasty caramel aroma. Take the saucepan off of the heat immediately. Pour butter into a glass dish to cool off and set aside. In a medium size bowl, add the flour, baking powder and baking soda and mix to combine. Set aside. In a large bowl combine the brown sugar, coconut sugar, coconut oil, Sweet & Salty Surrender and vanilla together with a hand mixer. Add in the first egg and blend. Then the second egg and blend. Now add in the cooled butter and mix with the hand mixer. With the hand mixer on, add about ½ cup of the flour mixture at a time to the wet ingredients and mix to combine. Add in the chocolate chips and incorporate with a wooden spoon. Cover bowl with plastic wrap and store in the fridge for at least an hour, preferably longer if you have the time. The last 20 minutes of the dough chilling, go ahead and preheat the oven to 350 degrees. Spoon about 1-1/2 tbsp. cookie dough and roll dough into balls with your hands and place on a parchment or silpat lined baking sheet. Bake for about 11 min. 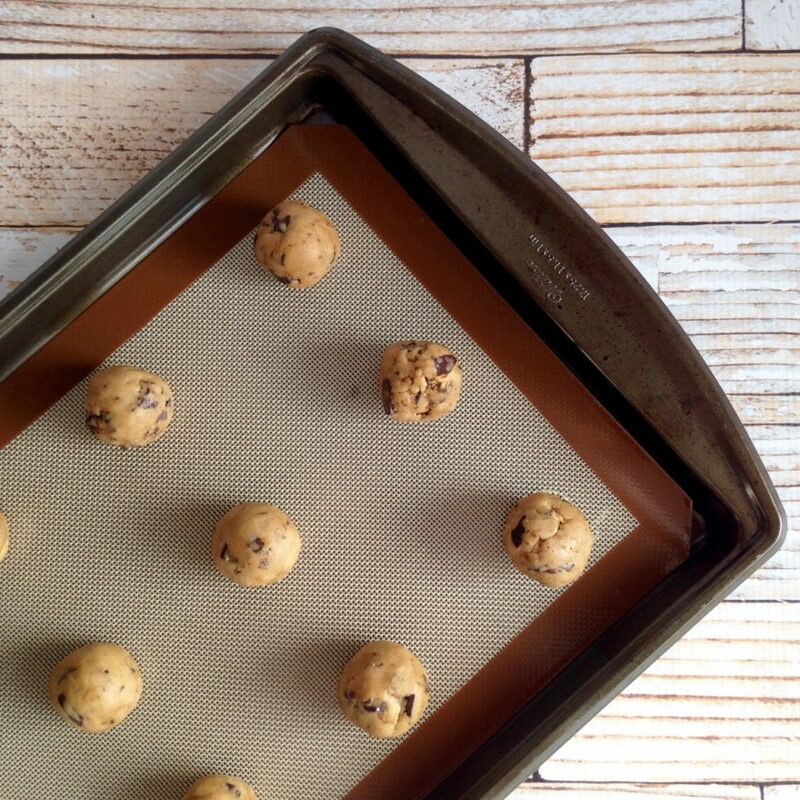 If using 2 baking sheets at the same time in the oven, be sure to rotate pans from top to bottom and bottom to top. Allow cookies to cool on a wire rack.